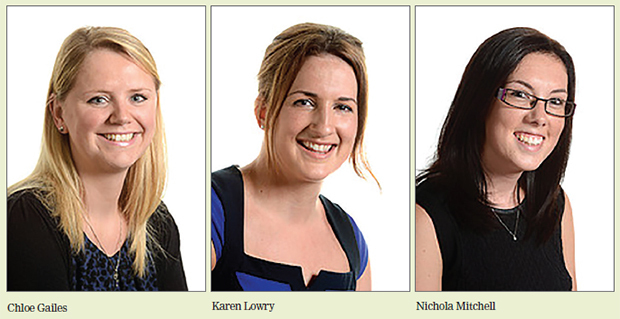 One of these three women will be crowned apprentice champion of the year. Chloe Gailes, aged 28, Karen Lowry-Hall, 31, and Nichola Mitchell, 22, have battled it out for the honour, but must wait until next month to find out who’s won. The former apprentices were whittled down from a shortlist of 10 before going to a public vote, which ended on Friday. Chloe, from Knutsford, represents Greater Manchester, Cheshire and Staffordshire, and works for Barclays. She studied with Mid Cheshire College. Karen Lowry-Hall, from Kidderminster, is an employee at Worcestershire’s Community Housing Group, and represents the West Midlands. She studied with Kidderminster College. Nichola Mitchell, from Wigan, is an employee at BAE Systems and represents Lancashire, Cumbria and Greater Merseyside. She studied with Winstanley College, in Wigan. The award, now in its second year, is sponsored by City & Guilds. Last year’s winner, Jenny Westworth, completed an advanced apprenticeship in aerospace engineering and now works at BAE Systems. The winner will be announced at the National Apprenticeship Awards at The Skills Show, in Birmingham, on November 14.